We are engaged of manufacturing and supplying a vast assortment of Glass Rod or Stirrers that is used for mixing chemicals when performing experiments. 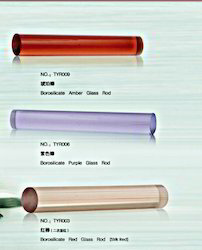 Made using borosilicate glass, these glass rods are durable in nature. Further, these rods find wide application in laboratories. We are proud to present premium quality Stirring Rods that are made from Borosilicate or ordinary glass tubing that offers durable and long lasting structure to them. The supreme rods, manufactured by us, are praised by our clients. The superior Glass Rods, offered by us, come in several sizes for easy recognition. Capable of catering to the varied demands of the customers, we are named amidst the respected Suppliers of colored glass rods. Apart from presenting the quality products, we deliver the same to the customers in the set time span. 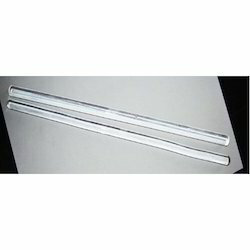 We are offering Glass Rod that are manufactured by using 3.3 borosilicate glass. For the manufacture of this product, the glass rod are softened or melted and then formed into rod shapes. Offered in varied dimensions and colors these find diverse applications in laboratory. Product Price : Price not diclosed. We are offering Fibre Glass Rods to our clients.